All of my kitchen cabinet doors are finally hanging on their hinges again! 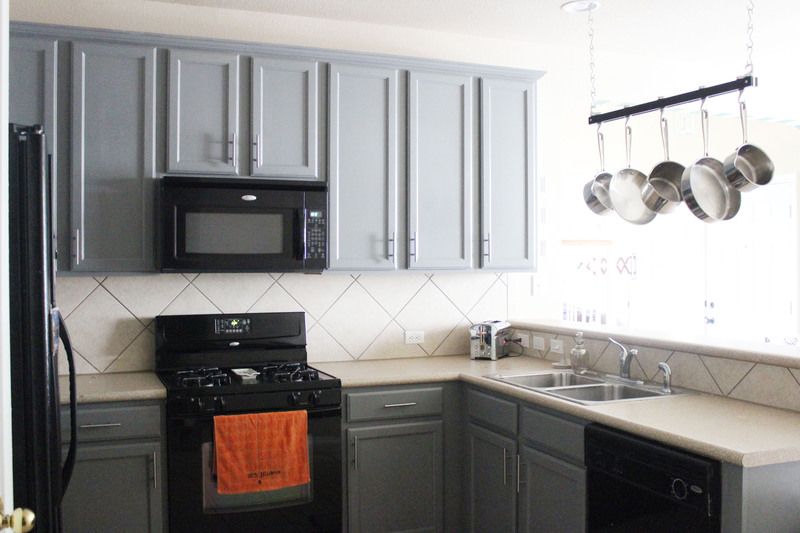 While the cabinets still need minor touch ups, it feels good to be finished painting and have a kitchen in one piece. This was by far the most time consuming project to date. If you have painted cabinets, you know the process. It is a lot of watching paint (and primer) dry. I love the change. Anthony thinks it makes the counters, which never bothered me, look better. 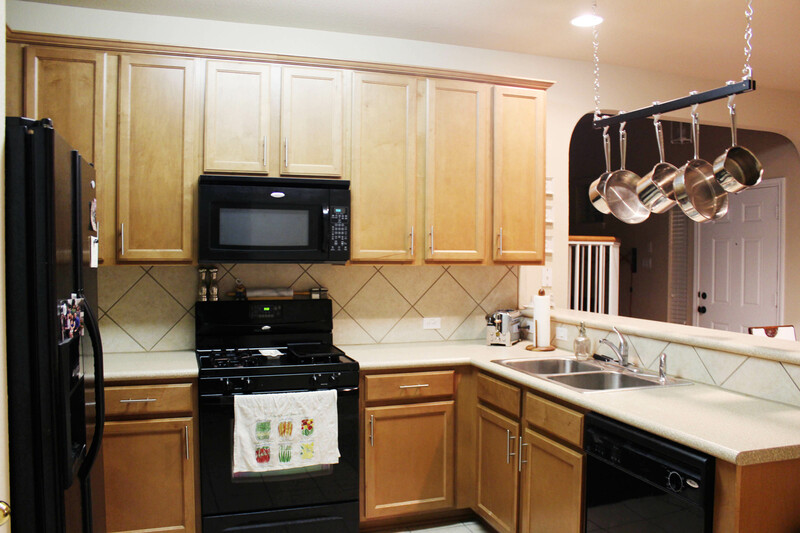 I think it makes the black appliances look better. I feel like $60 bought me a whole new kitchen. This looks fantastic. Love the colour. It looks so good!! Really does look like a whole new kitchen! Wow! It really makes a world of difference. I agree it goes so much better with the black appliances. Great change! It is amazing what a coat of paint will do! Ooh such a cute kitchen! It looks so good! What color did you end up using? It looks like a Blue/Grey? It looks a lot less blue in person. Good morning.. I know that this post is from a few years ago, but I am very curious how the paint is holding up? 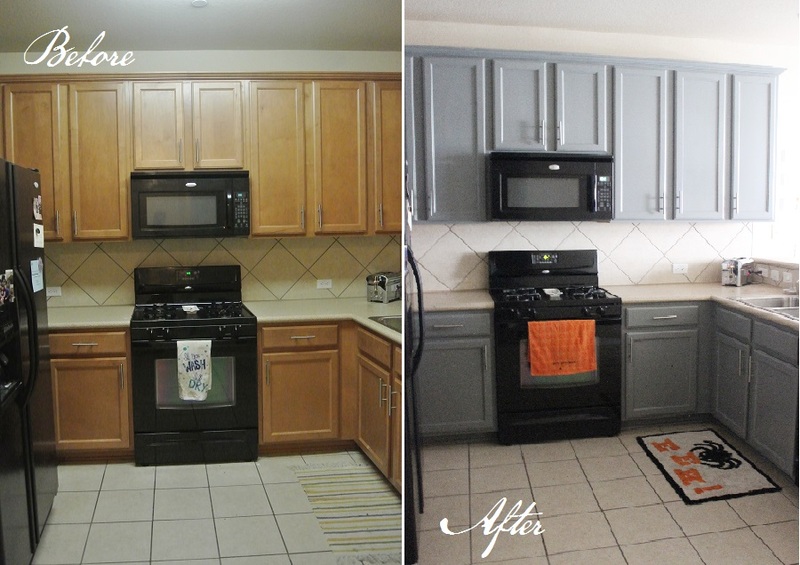 My husband and I were thinking of painting our cabinets with Valspar, so an update on this would be awesome! (If you already have a blog post with an update, I’m sorry I couldn’t find it). First, thank you so much for stopping by and looking around! I haven’t posted an update, but I really should. The paint is starting to wear in heavy-use areas, like right below the sink. I’d be happy to e-mail you photos if you’d like to see the damage. 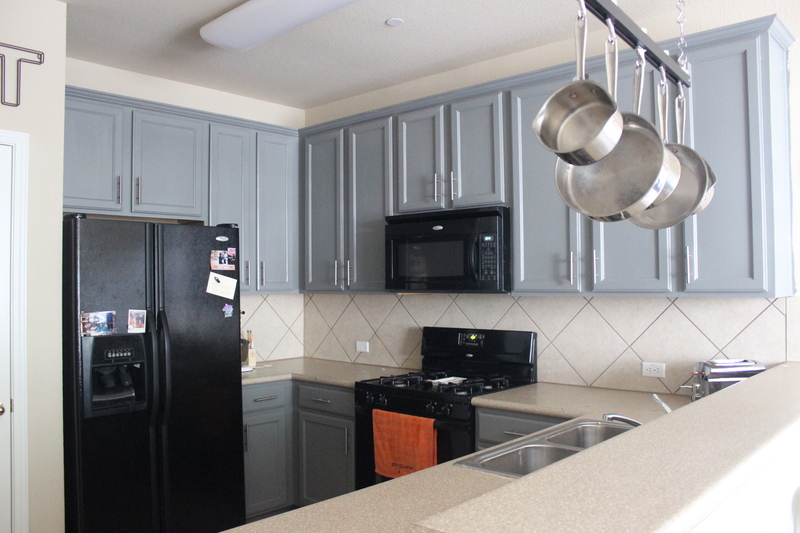 For the kitchen, as mentioned in the post, we went with bonding primer and Valspar’s Latex kitchen and bath paint. I also painted some nightstands with the bonding primer and latex paint, which has seen no wear at all.(https://gustoandgrace.wordpress.com/2014/02/14/nightstands-before-and-after/). From my experience, I think latex paint, even when applied properly, just doesn’t hold up perfectly in a well used kitchen. Based on the wear (not terrible, but existent), we opted of a light sanding, oil based primer, and oil based paint for our master bathroom, which you can see here: https://gustoandgrace.wordpress.com/2016/03/30/gray-navy-and-copper-bathroom/ So far, I have seen ZERO wear with the oil based paint. I have definitely learned a few lessons since painting the kitchen cabinets. If you’ll be painting soon, shoot me an e-mail, and I can give you some pointers. Let me know if you plan on brushing or spraying and if you plan on moving any hardware. I think I will write a post about the wear of the paint, once I give the bathroom a little more use.